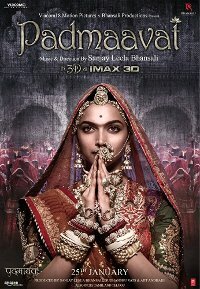 Set in medieval Rajasthan, Queen Padmavati is married to a noble king and they live in a prosperous fortress with their subjects until an ambitious Sultan hears of Padmavati’s beauty and forms an obsessive love for the Queen of Mewar. The film has led to disturbances in India because of alleged historical inaccuracies, and after religious and political pressure the name and release date were changed. In Hindi language with English subtitles. Note the long running time. This film is releasing in 2D and 3D. This is the 3D version. Drama, Period piece, Romance, Bollywood. Violence Moderate impact, frequent, minimal blood-letting, choreographed, unrealistic and stylised.